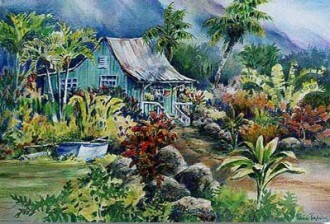 Patrice Pendarvis, invites her viewer to step into her paintings to experience the essence of old Kauai, to appreciate its scenic wonders and enjoy its floral beauty. For 34 years she has documented these visual messages through her art. Watercolor being her primary medium, she passionately explores its challenging characteristics through traditional as well as abstract approaches - the result is a masterpiece of light and spontaneity, ultimately inspired from nature.